You can rename panels one at a time using the Panel view or rename multiple panels using the Rename Panel command. But before you can rename panels, you must use the Preferences dialog box to enable the renaming of panel names. In the Thumbnails view, select a panel to rename. In the Panel view, type a new name in the Panel field and press Enter. Current Panel Only: Renames only the selected panel. 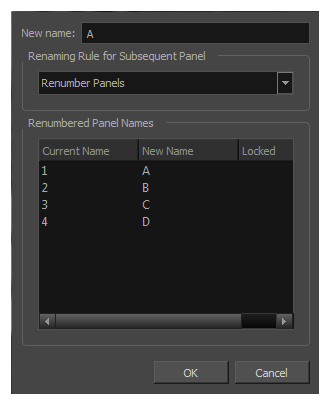 Renumber Panels: Renumbers the current panel, as well as all panels that follow. Renumber Selected Panels: Renumbers the first selected panel of a multiselection, as well as all following panels that are part of the multiselection. Renumber Prefix Only: Renumbers the panels’ numerical prefixes beginning at the selected scene. The new name must be a numerical value.